NEW YORK (CNNfn) - "Did you hear what happened to Intel today?" "Did you see what went on with Apple?" "Have you ridden Lucent down lately?" Such conversations have been a feature of 2000, unfortunately -- unless you're a short seller. For typical investors, this has been a sideways year at best. But it's also been the year of the Big Drop. Lucent Technologies �(LU: Research, Estimates) set the tone in the first week of January when an earnings warning caused it to shed $48 billion, or 22 percent of its market capitalization, in a day. (It warned again on earnings after the market closed Tuesday, and lost $34 billion). A stream of big-cap names has flowed over the same merciless drop. 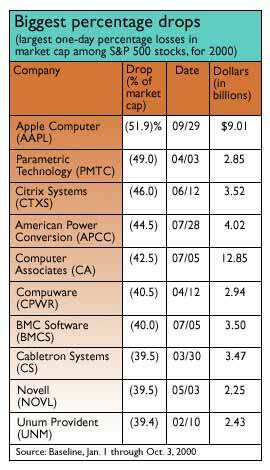 Most dramatically, and most recently, the hatchet fell on Apple Computer �(AAPL: Research, Estimates). It saw more than half its value, 51.9 percent, carved off on September 29, when it warned its fourth-quarter profit would fall far short of analysts' projections. That's the biggest one-day percentage drop on the S&P 500 this year. Half a company disappeared, or half its market capitalization anyway. A company's market cap is its stock price multiplied by the number of outstanding shares - its value on Wall Street, basically. A week earlier, Intel saw 2000's most-shocking market-cap meltdown in dollar terms. In all, $91 billion of the chip maker's worth evaporated on September 22, when it announced weak demand in Europe would cause third-quarter revenue to disappoint. Research company Baseline generated the numbers for this story. It ranked the S&P 500 for the largest one-day drop for each stock, in dollar and percentage terms. Baseline did not rank a second large drop for the same company, such as Lucent's large drop on Wednesday. Crashes do happen, of course, and companies do disappoint. But the big market-cap drops have not all come at once, as they do in a crash. They have made their way through the market like the Grim Reaper plucking the weak from the pack. One by one, big-name stocks feel the cold touch, and their collapse is quick and merciless. "It's almost as though we're getting a crash, and it's coming at us one stock at a time," said Hugh Johnson, chief investment officer at First Albany Corp. Ask not for whom the bell tolls. On May 2, it tolled for T - AT&T (T: Research, Estimates). Ma Bell's shedding of $18.8 billion ranks it the 14th-largest one-day drop this year, in dollar terms. A few months earlier, the bell tolled for GE (GE: Research, Estimates), which lost $25.3 billion on January 28. That ranked No. 10 for an overall loss. General Electric's decline accounted for only 5.4 percent of its market cap. But big-cap names have shed significant portions of their total value - AT&T's one-day swoon cost it 13.8 percent of its value. 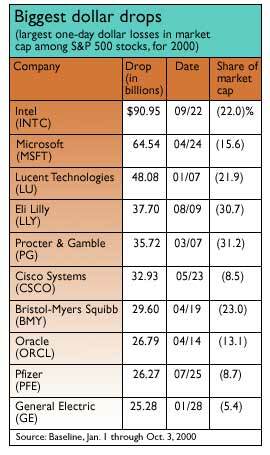 Stunningly, Procter & Gamble �(PG: Research, Estimates) and Eli Lilly (LLY: Research, Estimates), among the 10-largest dollar drops this year, both lost more than 30 percent of the whole company. In a single day. There are stock-specific reasons for the sudden decline in almost every case. P&G has struggled for some time and blamed a horrible second half to its fiscal year on raw-material costs and price pressures. Eli Lilly lost patent protection sooner than expected for its antidepressant, Prozac, then saw a raft of earnings' and analysts' downgrades. But it keeps happening. "There have been a lot of high-profile companies taking a lot of extraordinary drops," Johnson said. "When things go south for a company, they really go south." In fact, 47 companies on the S&P 500 have dropped 20 percent or more - at least a fifth -- of their market capitalization in just one day. Of those, 14 have dropped more than a third of their market cap in a trading session. They're not small names - Agilent Technologies (A: Research, Estimates), Computer Associates �(CA: Research, Estimates) and Apple Computer �(AAPL: Research, Estimates) all dropped more than a third in a day, and all three dropped at least $9 billion. The stats are perhaps even more shocking in dollar terms. Fully 32 companies in the S&P 500 have seen drops of more than $10 billion in a single day. Just under half of those crashes came in the middle of April, and seven came on one day, April 14. That day, Oracle (ORCL: Research, Estimates), Wal-Mart Stores (WMT: Research, Estimates), Qualcomm (QCOM: Research, Estimates), the American International Group (AIG: Research, Estimates), Citigroup (C: Research, Estimates), SBC Communications (SBC: Research, Estimates) and Yahoo �(YHOO: Research, Estimates) shed a combined $116.4 billion. While the big dollar drops tended to come in April, and the large percentage dips are concentrated in computer-related fields, the trends are not overwhelming. And that makes individual investors nervous. Many of the large percentage drops have come in the last three months. Technology stocks rely heavily on projections of future growth. Those projections were too high at the start of this year, according to Marshall Acuff, equity strategist for Salomon Smith Barney. "All those people who were waxing so bullish early in the year are now finding out the reality, that growth is slowing," Acuff said. When there's a slight adjustment in the growth outlook, it can have a dramatic effect on a stock's current price. As the economy slows and investors fret about profits, it has had a dramatic effect. "When you get disappointments on companies that are selling at 60, 80, 100 times earnings, you get more room to fall," said Al Goldman, chief market strategist at A.G. Edwards. But Goldman conceded there have been swift drops in non-tech stocks, too. "It is not normal to have that type of a drop in a supposedly quality, conservative growth company," Goldman said. The Euro is down. Oil prices are up. Companies are growing wary of making big purchases in computers - particularly in Europe, where American imports are suddenly 20 percent more expensive. There are plenty of motives for bad earnings. Top that with a market in a stiff correction, and investors desert not only sinking companies but also companies that might sink. After one company disappoints, others in its industry get forced down. They are sinking by association. "People are looking at this news as a glass-is-half-empty attitude," Goldman said. "They are jumping to the most negative conclusions." Mutual-fund managers and hedge-fund managers may shoulder some of the blame. They have the huge positions that can cause a stock to tank. "They tend to be like sheep. They are followers," Johnson said. "It's called piling on in football, and I think it's the equivalent. It's unprecedented." Mutual-fund managers may have other motives for selling. Many took profits when the markets peaked this spring. Many end their fiscal years in October, and they can now take losses to cover their gains, unlike prior years. So beaten-down stocks get further beaten down by tax-driven selling. Still, such sudden drops in favorite stocks leave many retail investors shaken. There has been little to gain stepping up to buy a beaten-down stock this year. Johnson thinks many have been backing away from the markets as a result. One positive - and it's a stretch - is that sudden one-day drops are better than the Chinese water torture of seeing a stock slowly shed its value. Maybe expectations are more realistic, too. "They say the markets are driven by fear and greed," said Spiros Segalas, fund manager of the Harbor Capital Appreciation fund, a large-cap growth fund. "We're certainly not in the greed part of the equation anymore."